As a watercolour painter this really strikes a chord Ralf. Delightful haiga. very beautiful! not a word out of place. perhaps you could try adding the words to the picture? Das "your" - gibt dem Satz eine persönliche Note, ist es Teil eines Gesprächs mit dem Maler/in? Der Klang der Farbe, die Nuancen von Farben, die sinnliche Wahrnehmung, Auditives mit Visuellem vermischt, finde ich besonders gelungen. ....sigh...I caught my breath, oh how many ways do I love this..precious precious words and that watercolour, it's exquisite...who's the artist? I think Lorraine has said everything - superb! Ralf, you are leaving classic haiku-rules, more daring using synesthesia. You are on the way to lyric poetry. Good decision. I estimate this way. Once you will say "I did it my way". I like courageous poets. Thank you very much everybody for your friendly comments. 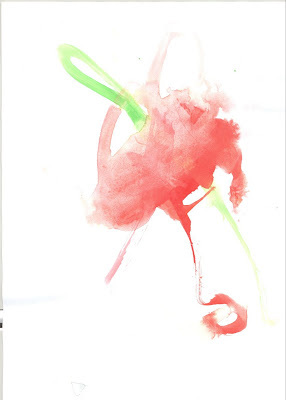 My son made this watercolour picture when he was two years old. I was fasinated, when he showed it to me. And I had Mr. Picassos word in my head that he tried to do everything to paint like a child. Yesterday I rediscouvered this painting among others. And the words found me. Ralf ... this is, perhaps, my most favorite of yours.